Geek Squad, a company known for its rather iconic fleet of VW Beetles ditched the bugs and brought four fully electric Mitsubishi i-MiEV’s to the 2010 Consumer Electronics Show (CES). The tech repair company said last week they are currently leasing the cars and plan on using them at retail locations. The compact i-MiEV is a svelte 2381 pounds and is powered by a mid-engine, 63-hp electric motor. To power the motor, Mitsubishi employed a lithium-ion battery pack that consists of 22 separate modules that are mounted underneath the cabin floor. Even with the motor in the back there is still room for the Geeks to store equipment. When a quick-charging system is employed, the i-MiEV can be recharged to 80% in just 30 minutes. A standard 220V outlet can charge the battery pack in 7 hours. The standard two-prong 110v outlet will charge the battery pack in 14 hours. The estimated range for the i-MiEV is 80-100 miles. To help the i-MiEV reach its estimated 100 mile range, there are two modes that are selectable on the shift lever. An Eco mode reduces power to the motor and regenerative braking can help squeeze out a few extra miles. The i-MiEV has dramatically lower fuel costs which should save the Geek Squad a good amount of cash. During off peak or nighttime hours, the i-MiEV will cost 1/9 the price to charge compared to a gasoline equivalent mini-car. The likely high lease price will offset this savings, so don’t expect Geek Squad to lower its prices any time soon. A common argument against electric vehicles is that they merely displace pollution. This may have been true for past EV cars, but not the i-MiEV. Mitsubishi says that the i-MiEV produces only 30% of the CO2 compared to a 660cc gasoline engine even when taking into account the power needed to charge the battery packs. 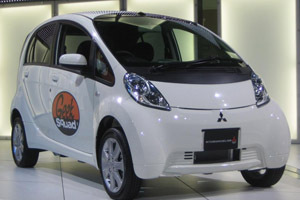 Mitsubishi has also made a few changes to the left hand drive i-MiEV that will help the Geek Squad get to their customers faster and safer. The wheel base has been extended to 100.4 inches, which is a 1.7 inch improvement. Front track has been widened by 3.7 inches and 5.3 inches in the rear. Front and rear overhangs have been increased which will provide better protection during a crash. Best Buy, the company that owns Geek Squad, is hoping to put the electric cars into service on January 13th at a retail location in El Segundo, California. Geeks fighting over who gets to drive the i-MiEV is sure to follow. TechArt singlehandedly creates Porsche Panamera aftermarket. 5 Greatest Video Game Cars--EVER!